When I’m not looking to the stars for meaning or getting down with my Kundalini yoga flow, I do my best to give back to the world I’m in. And that’s why I’m an Ambassador of Love for God’s Love We Deliver in NYC. God’s Love We Deliver is the area’s leading provider of life-sustaining meals and nutritional counseling for people living with severe illnesses. Meals are tailored for individual clients, cooked, and delivered to them, their families, and caregivers free of charge, without ever having a waiting list. To raise awareness for this incredible cause, Jason Patrick, a.k.a. 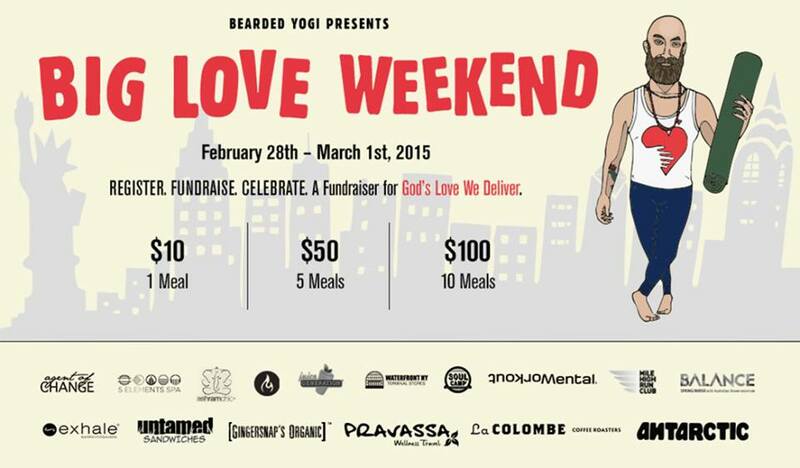 Bearded Yogi, created BIG LOVE WEEKEND benefitting God’s Love We Deliver. BIG LOVE WEEKEND begins with a Wellness Day on Saturday, February 28, 2015. The Wellness Day is a mini-festival held at The Waterfront. It will feature an inspirational talk by Gabby Bernstein; yoga with Elena Brower and Guillaume Brun; an Inten-sati class with Patricia Moreno; a #DOGPOUND workout with Kirk Myers Fitness; an exquisite puja ceremony; and two Wellness Panels with leaders and experts in the fields of Health and Wellness. On Sunday, March 1, 2015, we celebrate our fundraising efforts and personal transformation at the wellness day with an epic party. The event will be a lavish display of appreciation for gifting us with your presence and selfless service fundraising. There will be gourmet food, artisanal cocktails, live performances, dancing and celebrity appearances. I would absolutely love to have you come get down with me for this amazing weekend! For ticket information or to donate to my fundraiser, go here. I’m also interviewing Jason on the Life Coach Radio Network to learn more about God’s Love We Deliver, his own amazing journey, how Big Love Weekend came to be and how YOU can become an Ambassador of Love! Your Computer – Log into Blogtalkradio at showtime via this link. Can’t make the live show? You can relisten via the link above after it airs! February is Reason to Party! Full Moon in Leo, Sensual Venus in Pisces & the end of Mercury Retrograde! We start out the second month of 2015 with a beautiful Venus entry into the sign of Pisces. This is where all of your senses (including your intuitive 6th sense) will be heightened. It’s a time to dream and romanticize your goals. That’s right, bring a more sensuous side to your desires! The Pisces/Venus pairing will allow you to really slip deep into feeling what it is you are ready to manifest. Instead of just saying what you want, FEEL what it is you are in a space to create. Visualize exactly what you want to happen, with the knowing that it is already yours. Strut through the field of your aspirations and with each step, carry the energy of confidence and clarity. BE-COMING is really just your authentic self coming home to what it already know to be true. Let it happen. The Full Moon on 2/3 at 6:09PM EST is a time to express yourself and let your passions shine out! It is ruled by the sign of Leo, which is in a prosperous transit with Jupiter right now. This means it’s time to go even BIGGER! 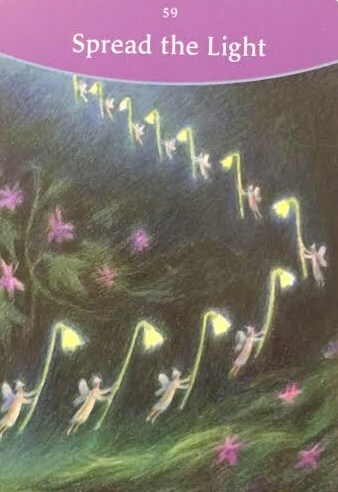 The Full Moon is a time of completion, so review where you are ready to go next level and then write those items down. Meditate on them with a deep knowing of their ability to transform into something amazing. Then offer them up in prayer and even burn the list as a way to claim that you are ready to ignite. When we burn, we are asking for the universe to help us take our visions higher. This is definitely a time to make your expectations a reality and when you offer up, you are showing your ultimate faith in the universe. Lastly, Mercury Retrograde will leave us on Feb 11th! For many of you it was a trying time and for others a super productive one. As we enter this final stretch, keep your schedule light and spend more time taking care of you. That doesn’t mean a binge fest of reality TV and ice cream (well maybe a mini one), however more so finding healthy new ways to reinvest in yourself. Try out a new fitness class or spend the day at the spa. Maybe it even means reorganizing your kitchen. When you spend time restoring yourself, you will discover new ways to be more efficient and productive in the long run! For more juicy tidbits during the first half of February, watch my latest YouTube video. And as always I love your comments too! Let me know your Full Moon ritual or how you rose above to make Mercury Retrograde work for you! New Moon in Aquarius & Mercury Retrograde! Just as the Sun moves through the zodiac every month (which is how you figure out your commonly known birthday sign), the Moon cycles around the astrological signs too! On Tuesday, January 20th, the next New Moon cycle will start at 8:14AM EST in the sign of Aquarius. What does this mean for you? Whether you’re an Aquarian Sun sign or not, you’ll feel the effects of what this sign radiates. Aquarius is represented as the water bearer. They are giving, strong willed and here to serve. Their downfall is often not taking even time for themselves and needing to isolate to avoid wash out. During this time, I invite you to see where you are looking to give as well as dedicating time for what you need to nurture your own soul. It is also common to hold a ritual at the dawn of the New Moon. Within 48 hours of it’s onset (ideally 24 hours), find a quiet, meditative place to journal. I like to keep one journal to use throughout the year to log my moon writings. For this particular time, I would love for you to go big! The cosmos are lining you up for transformation and it’s an opportunity to cultivate the seeds from your subconscious and redirect them for optimum growth. Where do you feel most connected on your journey right now? What deep visions are ready to go forth? Use your intuition and trust as you write. Be open minded and allow the dreams to come out to play so they can be made into your reality! Keep the journal in a safe place and await for the next steps at the Full Moon in Leo on February 3, 2015! Another planetary shift is Mercury Retrograde from January 21-February 11, 2015. Many people freak out during this time because this planet rules communication, technology and messages. I am assuring you that it will be okay! Any mishaps that may happen are just to teach you a lesson to stay positive and to also SLOW DOWN. It’s a reminder for when we have too much on our plate and when we are overloaded, then clearly there is more room for error. I encourage you to rise above this Mercury RT and smile when a miscommunication or tech glitch arises. Stay organized and give yourself room to breathe. And watch my latest forecast for even more details on the cosmos during the month of January! p.s. I freaking LOVE your questions & comments! 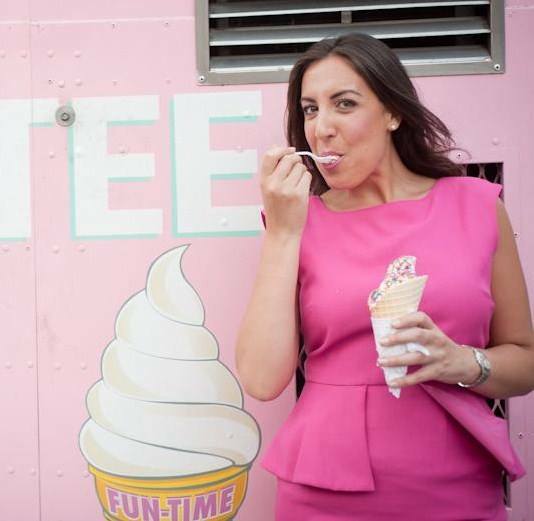 Send me an email at danielle@daniellemercurio.com or leave a comment below!